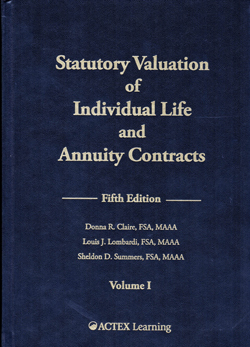 Statutory Valuation of Individual Life and Annuity Contracts, 5th Ed. This book covers the basic principles of the statutory valuation of individual life insurance and annuity contracts in the United States, including experience studies, model governance, and risk-based capital. It was written both for practicing actuaries and those considering a career in financial reporting, product development or risk management. The Fifth Edition of this book, previously titled Valuation of Life Insurance Liabilities has been divided into two volumes. Volume 1 focuses primarily on basic principles, the valuation process, model governance, and formula-based reserves. Available now.